atmosfair, EcoLibro and time2sustain launch the second round of sustainability benchmarking in business travel and mobility for companies. Discover how your company is positioned in terms of sustainability for business travel and mobility compared to peers economically, socially and environmentally. Receive with little effort specific measures to further improve your sustainability in business travel and mobility. 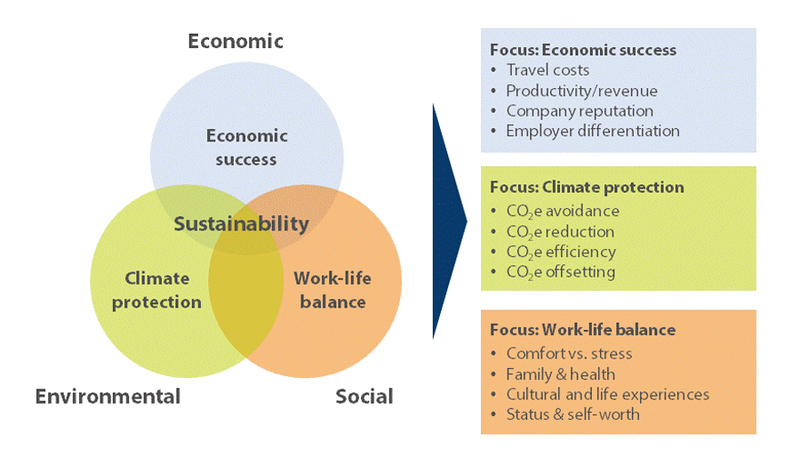 Sustainability in business travel and mobility means balancing the triple bottom line of travel-related productivity and cost efficiency (economic dimension), climate protection (environmental dimension), and work-life balance for employees (social dimension). By analyzing your sustainability positioning in relation to other companies, we want to empower you to identify further opportunities for improvement. Gain access to best practices and exploit your full sustainability potential. If you are just getting started with working on sustainability within your company, this will give you an immediate kick-start and allow you to systematically lay the groundwork for sustainability in business travel and mobility. If you are already well on your way, you will be able to see where you stand in comparison to peers and will receive specific indicator data and measures to take your efforts to the next level. Knowing your actual positioning will give you additional confidence for communication with internal and external stakeholders. Please request participation fees from your direct support contact listed below. You can select your scope to include all benchmark areas (business travel, company vehicles, and employee vehicles) or only benchmark single areas. 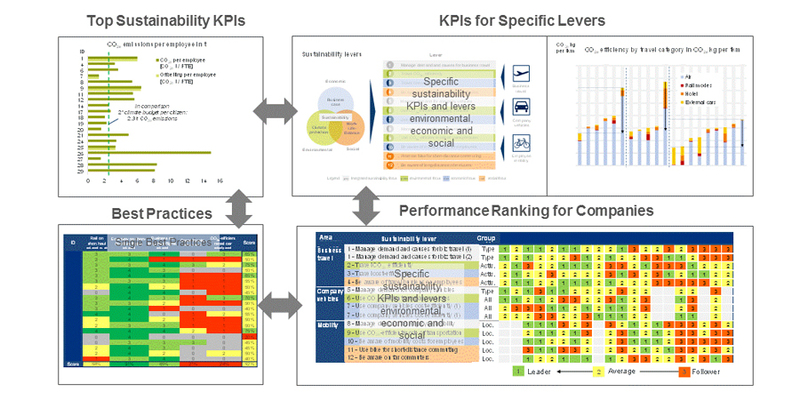 You will then receive a basic report containing cross-sector results. In addition, you can opt for an individual report specific to your industry, provided there are a sufficient number of companies in the panel, or for running an internal benchmarking of various business units in your company. The benchmarking covers all business travel categories (e.g. air, rail, hotel, rental car, etc. ), company vehicles (e.g. cars and bikes), and employee commuting between the home and the workplace. You will receive a questionnaire in Excel, which focuses on the key data points and best practices in the respective benchmarking area. The questionnaire will be divided into modules, so that various colleagues in your company can work on different sections. You will be assigned a personal support contact from atmosfair, EcoLibro, or time2sustain depending on your preferences, who will be available to assist you in filling out the questionnaire. Further support services are available on request, should you need additional support for the benchmarking process and the questionnaire. If you do not have any CO₂ emission data on business travel or employee commuting, we can provide you with a one-time CO₂ report for your business travel and an employee commuting analysis at your request. This service is free of charge for first-time benchmarking participants. All data in the benchmarking process will be treated as strictly confidential and participants will remain anonymous. Only sanitized, aggregated figures and findings will be shown. It will not be possible to identify specific companies from the results.